It’s here and I AM READY! and a generally creamy, spicy, YUMMY vibe, I am all in. You guys, this soup! Stew? It’s kind of both. It depends on how you make it and how much liquid you add, but EITHER WAY IT IS SO DARN GOOD. It literally checks all the boxes – creamy, satisfying texture; extremely awesome flavor; super nutritious; doesn’t take five and a half days to make. It doesn’t have meat, but girl, if you want meat, add meat! Not huge on kale? Swap for spinach. These are my favorite kinds of recipes – ones that just kind of let you do whatever you want to do and make it your very own. I don’t think we could have picked a better recipe to kick things off with because I fully believe this could become a January staple for you. So raise your hand if you got an Instant Pot for Christmas. Yeah? This can be made in the Instant Pot! And it can be made in its cousin, the slow cooker! AND it can also be made on the stovetop in almost the same amount of time! You just need to babysit it a little more. But hey – babysitting garlic, onion, jalapeño, sweet potatoes, and a creamy soup base as it comes together happens to be my all-time favorite kind of babysitting. You have no excuses. I am not letting you get out of making this recipe. This soup is cozy and lovely. It’s not too spicy, although you could just omit the jalapeño altogether if you were worried about that. It has just the right balance of creaminess and kick and it reminds me of another version of a good-for-you curry. Speaking of which, this would go great over some brown rice or quinoa. Blanket, soup mug, and Netflix, coming right up. 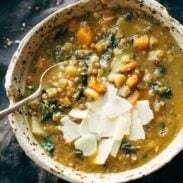 If you make this soup (or any of our recipes for Sugar Free January), be sure to tag @pinchofyum or use the #POYsugarfreejanuary hashtag so we can see! Okay, YUMMMM. Spicy Peanut Soup with Sweet Potatoes + Kale! Comforting and SUPER nutritious. Naturally vegan, gluten free, refined sugar free, ALL THE GOOD THINGS. Heat the olive oil in a large soup pot over medium heat and add the onion, garlic, and jalapeño. Saute until soft and fragrant. Add sweet potatoes. I like to brown them a little bit with the aromatics to get them nice and flavorful. Add tomatoes, coconut milk, water, spices, and peanuts. 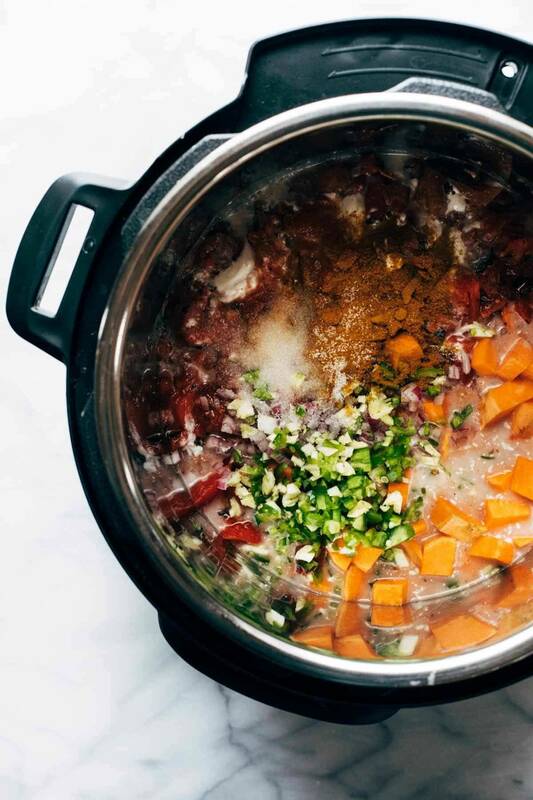 Simmer until sweet potatoes are fork-tender. Add peanut butter and kale. Simmer until everything is thick, creamy, and delicious. Top with more peanuts and a little cilantro if you’re obsessed like me. Instant Pot: Cook everything except peanut butter and kale on high pressure for about 3 minutes. (Sometimes I reduce the liquid when I make it in the Instant Pot by a cup or so, and then just add more as needed when it’s all done. But that is optional – it should work fine either way.) Stir in the peanut butter and kale after cooking. Voila! Slow Cooker: Cook everything except peanut butter and kale on low for 6 hours. Stir in the peanut butter and kale. Donezo! Don’t cook the sweet potatoes too long or they’ll fall apart on ya! Just cook until they pierce easily with a fork. If you’re doing Sugar Free January with us, this is an excellent recipe that has natural sweetness and nutritious fats to keep you full. I like to dip into this with some seedy crackers – you can find our product recommendations on this post. One last note. This recipe is inspired by an amazing West African recipe called maafe, or groundnut soup. I did what I always do and changed/added some ingredients based on what I love and what I had on hand (kale, jalapeño, coconut milk, cilantro, etc.) making it more of a cultural mash-up. That’s why I’m not calling it a proper West African peanut soup even though those are its roots. If you want a legit West African version of that soup, here are two sources – a blog post, and a video. At what point do the tomatoes go into the recipe? It looks delicious, but the instructions do not mention anything about the tomatoes, yet they are in the ingredient list. Just added those into the instructions! Sorry about that. Where do the tomatoes go in? Thanks! I made a BIG batch of ‘sunshine sauce’ and doused your ‘med bowl’ with it, with some grilled steak on top – the sunshine sauce is sooo delish, spoon-drink worthy! Also made ‘autumn glow’ smoothies for bfast; we’re on a roll over here! It’s hard not to have a sweet treat after a savory dinner though. Made this on the stove top tonight and it was delicious! Doubled the kale, added extra water to accommodate the three large sweet potatoes I used. Definitely will be making again! Made this tonight. It’s a solid recipe. I ended up needing to put a whole extra teaspoon of salt in, but otherwise it’s a tasty soup, and very filling. Not an award winner, but tasty. This was lovely! Couldn’t find fire roasted tomatoes, so just used a can of regular diced tomatoes and it was still delicious. I have a question about the peanut butter? What brand do you use if it is suppose to be a no sugar recipe? YUM, that’s all I can say! I have some of your wonderful yellow curry in the freezer. Is there any reason not to use that in this recipe? Love this recipe. I failed to add the coconut milk until the last step, it still seemed to work well. I let it warm for 10 mins and everything seemed to cook well. I just made this tonight- have always wanted to try West African peanut soup and this modified version was fantastic! I subbed spinach for the kale because I happened to have it on hand. Soooo tasty! I’m going to post my pic tomorrow. Thanks for sharing this amazing recipe with us! Perfect soup for these cold winter nights!!! I made this tonight in my instant pot. The flavors were delicious and it was super easy but the 10 min setting seemed to be a little much. My sweet potatoes were really mushy and broke apart and I made sure to cut them fairly large. Next time I’m setting it on 8 minutes! Absolutely incredible. Outstanding flavour. The peanuts offer the perfect crunch. Couldn’t be better! I made this tonight. It’s amazing. So good on so many levels, you can taste each and every ingredient at different times all in one bite. Oh so good. Made it in the Instant Pot with spinach. Can’t wait to do it again! Super easy to make and delicious. I used an Instant Pot and will reduce the cook time next time I make this as the potatoes were a bit mushy. I did run an immersion blender through it to make it a bit creamier. Hi, made this recipe yesterday with the cooktop method but wasn’t sure which step to add the tomatoes in. Could you please explain this step for this method? I made this soup in the Instant Pot last night, and we LOVED it! You are the queen of vegan soups, I’ve determined. 🙂 Thanks so much for the recipe. I threw everything in the Instant Pot without sauteing anything first, and cut down the water to just 1 cup. When I added the kale and peanut butter at the end I added a little more water. Yum! I totally want to make this tonight! I have everything except the fire roasted tomatoes. Do you have another sub for that? Like regular diced tomatoes plus something? Or a can of rotel? Just wasn’t sure if the rotel would make it tooo spicy since it already has the jalapeno in it? I’d just used regular diced tomatoes! Is there a way to substitute the fire roasted tomatoes without losing too much flavor? They are impossible to find where I live here in Germany. Just used canned diced tomatoes! Is there a particular type of peanut butter you’d recommend? We normally buy reduced fat creamy – would that work, or would another kind be better? We love using natural peanut butter, but any type will work!